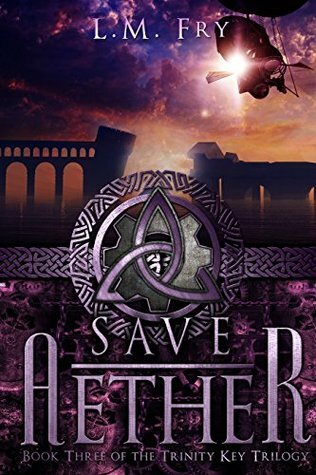 Save Aether starts where Escape Aether ends….with the girls on trial for combining the Trinity Key. I will have to say that while I didn’t care for Julia in the first couple of books, I really liked her in this one. She was so snarky, such a wiseass that I was dying laughing while reading. Slammy Magee (aka Slammy) was a favorite nickname of mine that she gave one of the Elders….lol. She was a more act first then think later kid and it did help her out a few times in the book. Valera continued to blossom into her own person in the book and I loved it. She was not the timid, meek girl that we met in Into Aether. She was not afraid to stand up for herself or her friends….even if that meant destroying her relationship with her mother, her brother, and her siblings. Theo got even stronger in this book. She was the brains and the backbone of the group and she always thought things through before acting. She also had the most control of her powers (behind Valera….Julia was last and she was still learning). Her relationships with Victor and her parents meant everything to her but she was going to do what was right by freeing Danu. I absolutely loved the Danu storyline. If any of you guys are into Celtic mythology, Danu is the mother goddess of the Tuatha De Dannan (click here for the definition). See, at one point in my life, I was very much into Irish folklore and Irish mythology. So when I see it being used in a book, I get very excited (I know, complete nerd). The author did a great job of using the concept of Danu and giving her a huge spin. I really wasn’t ready for that spin when I read it….lol. The ending was perfect for the series and I don’t think I could have written it more perfectly if I tried. Why: A great ending to a great trilogy. This book packs a punch and pulls at your heartstrings.